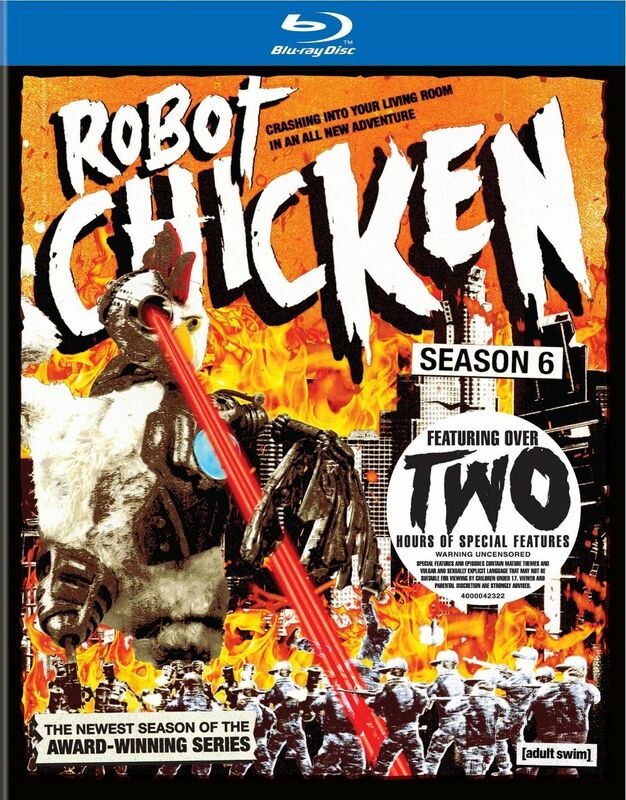 Season 6 of Robot Chicken was recently released on blu-ray and DVD, and what a release! It not only contains all twenty episodes of season 6 but it also contains a ton of extra features. For those familiar with the show, I don't have to tell you how funny this is. You'd think after five seasons they might start running out of ideas, but the writers just keep pulling hilarious skits out of their bizarro imaginations. And there are a ton of guest voices this season, many of whom actually voice themselves or characters that they played. Some notable guest voices are Patrick Stewart, Sam Elliott, Daniel Radcliffe, Mark Hamill, Liev Schreiber, Alex Winter, Brent Spiner, Zachary Levi, David Hasselhoff, Stan Lee, and Frank Welker. Now if you haven't ever seen the show before it's like a skit show but with stop-motion action figures. Most skits feature characters from 80s cartoons, TV shows, and movies though there are also skits based on more recent media. Each episode is only about 12 minutes long but they manage to pack a ton of belly laughs into each episode. I don't know if I'd be able to stand a full half hour at once. Every episode in this release is not only uncensored, but also contains an audio commentary. And that's just the first of many extra features, as there's also a bunch of featurettes, outtakes, deleted animatics, and more. So there's like 4 hours of episodes and then hours more of additional features, so this release is totally worth getting without a doubt!